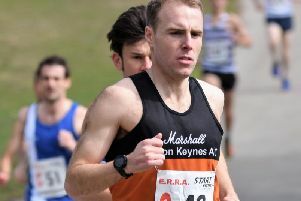 Marshall Milton Keynes’ senior men’s track and field team opened their Division One Southern League campaign at Bedford but got off to a disappointing start with a fourth place finish. The ladies fared better with the higher points scoring. Star of the day was Emma Beardmore who competed in all four throwing events. She won her speciality, the hammer throwing 44.84m and then the shot(10.70m). Her third win came in the “B” string discus(34.29m) and finally Emma threw the javelin 20.78m for 4th place. Laeken Impey won the “B” hammer throwing 42.91m. The Gibbens’ sisters contested the high jump. Rachel winning with a height of 1.60m and Sophie jumping 1.40m for 2nd place in the “B” event. On the track Lara Bromilow placed 2nd in the 3000m(10.35.19) whilst Nadine Lewecky, in her track debut, won the “B” race(10.51.50). Casey Hodges placed 3rd in the 100m(12.71) and 2nd in the 200m(26.70). Their 4x 100m relay were narrowly beaten for first place as they recorded 51.97.